You can download the pdf version of this fact sheet here. You can download the detailed table of all curfews and right to life violation datas in between 16 August 2015 to 8 January 2016. 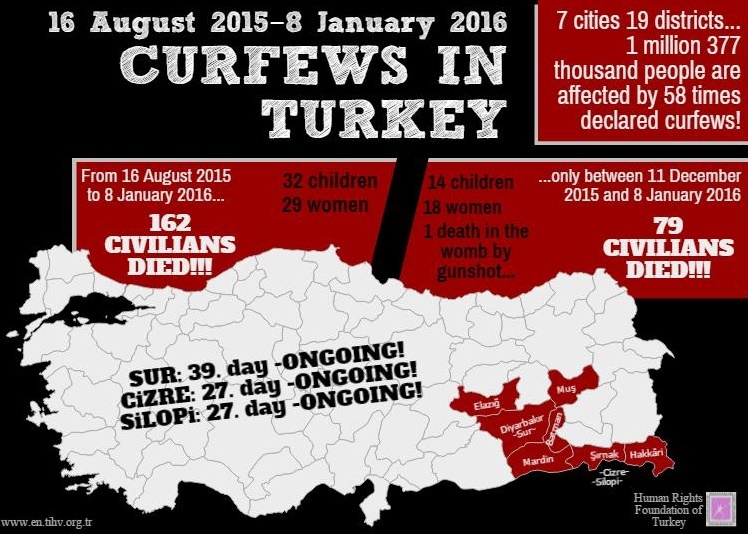 Since 16 August 2015, there has been 58 officially confirmed, open-ended and round-the-clock curfews in at least 19 districts of 7 cities (primarily Diyarbakır, Şırnak, Mardin and Hakkâri) that approximately 1 million 377 thousand people resides (according to the 2014 population census). During these officialy declared curfews, fundemental rights of people such as Right to Life and Right to Health is violated and 162 civilians (29 women, 32 children, 24 people over the age 60) lost their lives according to the data of HRFT Documentation Center. Between the dates 16 August 2015 and 11 December 2015, there was again curfews without any legal basis. However, beginning from 11 December 2015 the impose form of curfews, the broadness of regions that curfews are declared, military dispatch and thoughen statements of government and State officials shows that beginning from 11 December 2015, a different step has been taken, another period has begun in especially some districts of the region. The curfews declared on 11 December 2015 in Sur District of Diyarbakır (again, after 17 hours of break), Dargeçit District of Mardin (lifted on 29 December 2015) and on 14 December 2015 Cizre and Silopi Districts of Şırnak and again Nusaybin District of Mardin (lifted on 24 December 2015) are still going on and only in these last 29 days at least 79 civilians were killed (14 of them are children, 1 of them is death in the womb through gun shot, 18 of them are women and 15 of them are over the age 60). Moreover, according to the statements of witnesses at least 22 of these people were killed while they were within the boundaries of their homes, due to opened fire or hitting by a missile or due to the direct stress effect of curfews on their health conditions. NOTE: Within the context of this fact sheet the term ‘security forces’ is implying to ‘Police Anti-terror Combat Team, Police Special Forces, Gendarmarie Special Forces, Military Forces and Riot Polices.’ Also, there are some teams which are both by themselves and publicly defined as JİTEM, Esedullah, Hançer Teams etc. Even though it’s not officialy declared, according to the national media almost 10 thousand members of security forces are active in operations in each district that curfews are ongoing (Cizre, Sur, Silopi). Moreover, it’s known that hundreds of armored military vehicles such as tanks, panzers, cannons etc. Are dispatched to the relative districts/cities. These people are: Şerdıl Cengiz (21-Bağlar district), Şiyar Salman (18-Bağlar district) and Şiyar Baran (13-Seyrantepe district) in SUR and Emire Gök (39-Gırnavas Mah.) in NUSAYBİN. Note: In Nusaybin, the curfew was declared first in some districts. On 4th day it was broadened to whole district.